Fun With DNA, or, Will Oprah Boost Me Over the Brick Wall? Last year, I listened to a Genealogy Gems podcast, where host Lisa Louise Cooke (http://lisalouisecooke.com/) interviewed Bennett Greenspan, President & CEO of Family Tree DNA. I'd also heard a talk earlier in the year by Dr. Bryan Sykes, Professor of Human Genetics at the University of Oxford. 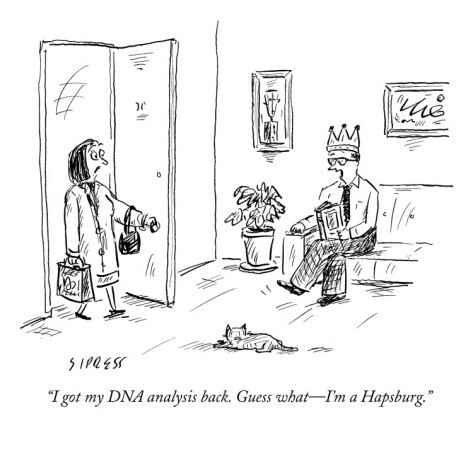 In the years since DNA testing has become widely available to the public, I had remained uninterested in the subject. Whenever a genealogy magazine published an article on the topic, I would skip to the end to see how it turned out. I also had concerns about privacy, and which company had an established history. Once I learned about autosomal testing, however, I became intrigued. This is how the Family Tree DNA website (FamilytreeDNA.com) describes their "Family Finder" test: "Family Finder uses autosomal DNA (inherited from both the mother and father, four grandparents, eight great-grandparents, etc.) to provide you a breakdown of your ethnic percentages and connect you with relatives descended from any of your ancestral lines within approximately the last 5 generations." It dawned on me that the window for collecting a DNA sample from my 88-year-old mother is rapidly closing. And so began the great DNA collection project. How would I approach the subject from two states away, where my mother lives in nursing home care? Luckily, my sister lives near her, and was on board. Now, mom is the feisty type, who doesn't necessarily agree with a first request. She also spends a lot of time having various medical tests and procedures. We were afraid that asking for a DNA sample would be one of the few things she could control, and she'd say no. My sister opened the topic by explaining that our mother would be contributing to science, and that we might eventually know more about the connections and origins of her beloved "daddy." We also had a secret weapon. My mother is a huge admirer of Oprah Winfrey, who'd had her DNA tested. I'm not familiar with the details, but apparently my mother knew all about it. My sister brilliantly reminded her of Oprah's story when she asked mom about getting a sample. Apparently, what's good enough for Oprah is good enough for my mom, who agreed with enthusiasm. A little ruse we employed, was to have my sister rub a plain old swab inside her own cheek, to show how painless it was. Then she said, "Okay, your turn!," and produced the actual test kit for my mother. Off it went in the mail to Texas. Fast forward almost three months. We were stunned at how eagerly my mother anticipated the results. When I was notified that they were ready, I took a quick look. My mother is described as Western European, comprised of 89.78% Orcadian, and 10.22% "Palestinian, Adygei, Bedouin, Bedouin South, Druze, Iranian, Jewish." Hmm. They lost me after Western European. I also checked out some of the people described as having matches to my mother, and will study that topic further at a later date. My sister, after hearing all of this, got to work on the internet to turn this into an entertainment opportunity for mom. Turns out Orcadian refers to the Orkney Islands near Scotland, and serves as sort of a genetic crossroads. Orcadians are the descendants of Iron Age Picts, Vikings, and Scots (sounds pretty British, which wasn't much of a surprise). There are a number of fun websites online devoted to things like local Orkney festivals. One of these is the annual celebration of the horse. Since our mom owned and was passionate about horses her entire life, she was thrilled about that connection, yelling, "See? I was born to ride!" And, she gave a belly laugh about her 10% desert heritage. She hasn't stopped talking to everyone about "her" results. My sister says it's as though she dreamed up her own perfect genetic cocktail. Remember me saying I wasn't much of a scientist? That hasn't changed. I still have way more questions about what all of this means. And, I have come to learn that this test isn't going to provide many firm answers. For one thing, nobody's vetting the research on the paper genealogies provided by the test subjects. We only know we are related, but not necessarily how, not even whether it's on the maternal or paternal lines. And, in some cases, we might only be genetically related in the sense that we're white Europeans who spent time in Ohio, for example, which isn't the same as being "related." But, does this matter to my mother? No! In fact, we all had so much fun with this, I ordered another test to be done on my mom. This one is for the full sequence mitochondrial DNA, which studies the mother's mother's mother's line deep into history. We'll now be able to tell her more about her oldest female ancestor. No doubt she'll be thrilled about this, too. I'm having an extra sample kit stored for the future, when newer tests might unlock more about our ancestors. It's been quite an undertaking, making a rainy winter in rural Washington very exciting for a fragile senior citizen. Thanks Oprah! Among the more unusual items that have passed through the generations of my family is this 19th-century coffee grinder. It's known to have belonged to my 2nd great-parents, Isaac L. Myers and his wife, Hester Burgard, who was called Hetty. One theory is that he constructed it as a gift for her at the time of their Civil War-era wedding. I'm not sure whether this part is true. While there are certainly some elements of the piece which could have been built by hand, the mechanism probably wasn't. There are some patches of glue on the back side of the drawer, perhaps it was repaired along the way. I've seen similar items on eBay, so a coffee grinder from this period isn't especially rare. Isaac L. Myers was born 4 April, 1841, in York County, Pennsylvania. He served just over three months in Company B of the 1st Battalion, PA Volunteer Infantry during the Civil War. The timing of his enlistment, in June of 1863, suggests that fears of the Confederate advance toward nearby Gettysburg must have prevailed over the pacifist teachings of the Church of the Brethren, of which he was a member. Or, perhaps he was restless for "adventure." Whatever the circumstances, soon after he moved to Astoria, Fulton County, Illinois. 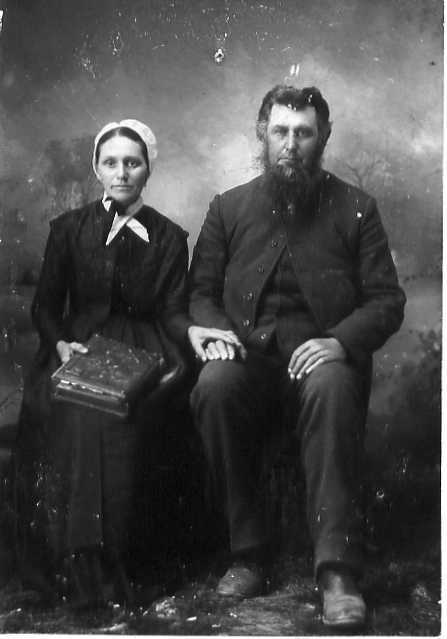 Hester Burgard, born 31 March 1844 in Cumberland Co, PA, was a member of the Brethren Church there. Isaac had become the singing master of the church, and Hetty "set her cap" for him. He never stood a chance: they were married March 5, 1865. The couple lived at various times in Illinois, Kansas, and finally in Washington state, farming and serving the Brethren community. They became parents to two sons and two daughters, all of whom left descendants. Isaac died in 1912, Hetty lived on until 1932. I was able to visit their last home together shortly before it was torn down. Today the site, on the corner of Gold & Locust Streets in Centralia, Lewis County, Washington, stands vacant. Whatever the origins or value of this old, beat-up coffee grinder are, the link to this hard-working, kind, and loving couple is priceless.